Atomos Connect Convert Scale HDMI to SDI features full size 3G/HD/SD-SDI, lockable HDMI, lockable DC power, removable included mounting ears and conversion/frame rate/resolution scaling up to 1080p60. The Atomos Connect Scale HDMI to SDI converts a HDMI video signal to a standard SDI stream for compatibility with industry standard broadcast and video equipment. Atomos Connect HDMI to SDI is a HDMI to SDI scaling converter featuring full size 3G/HD/SD-SDI, lockable HDMI, lockable DC power, removable included mounting ears, a rugged metallic housing and conversion/frame rate/resolution scaling up to 1080p60. 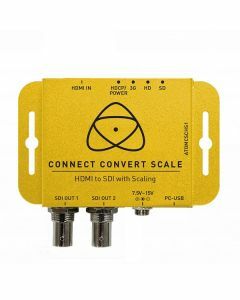 Just like the SDI and HDMI connections, the Atomos Connect Scale HDMI to SDI’s DC power connection is locked in with a screw thread sleeve that secures the power connection in place. Each converter comes in a streamlined metal housing with detachable mounting ears, creating flexibility for Broadcast and ProAV applications. Aside from mains power, there are options to power the Atomos Connect Scale via USB, delivering the ability to run for hours from simple smartphone power banks or TV USB sockets.